During a yearlong residency at the Museum of Contemporary Art Chicago (MCA), Macuga developed the script for a play titled Preparatory Notes for a Chicago Comedy (2014) and a set for the production, _Preparatory Notes _(2014). This project was inspired by the work of pioneering and unconventional art historian Aby Warburg (1866–1929) and in particular by his unpublished play Hamburg Conversations on Art: Hamburg Comedy (1896), which traces the struggles between Hamburg’s avant-garde and art traditionalists. Macuga’s adaptation of Warburg’s script reflects on how debates about the role of art and its relationship to society continue to resonate today. In preparation for this work Macuga, along with MCA curator Dieter Roelstraete, conducted extensive research at various sites around Chicago and at the Warburg Institute at the University of London. Macuga’s hour-long play, which premiered at the 8th Berlin Biennial for Contemporary Art in May 2014, draws connections between Warburg’s writing on the rites of indigenous cultures—in particular Native-American serpent rituals such as the Hopi people’s Snake Dance—and the performative roles that contemporary art–goers assume when attending international exhibitions and fairs. In Macuga’s play, a pair of actors take turns portraying Warburg, while two acrobats and two actresses adopt a variety of guises including a flying carpet; a pair of writhing snakes; performance artist Marina Abramović; Russian oligarch Roman Abramovich; and Dr. Ludwig Binswanger, the psychiatrist who diagnosed Warburg with mental illness. 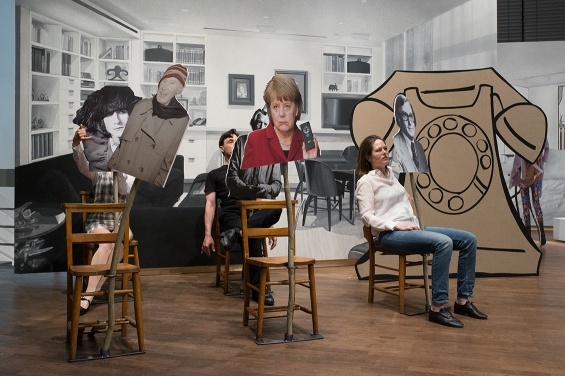 Other characters in the play, including Chancellor of Germany Angela Merkel, artists Richard Artschwager and Andrea Fraser, and Macuga and Roelstraete themselves, are represented by cardboard cutouts mounted on branches and posed in front of hand-painted backdrops that are based on photographs of the homes of MCA trustees and collectors. Preparatory Notes connects to Macuga’s tapestries as disparate figures and narratives are woven together through the enactment of the play. Full support for “Goshka Macuga: Time as Fabric” can be viewed here.